The effects of Fees Must Fall (FMF) protests are long-lasting and damaging to studentsâ€™ mental health and ultimately affect their academic performance. 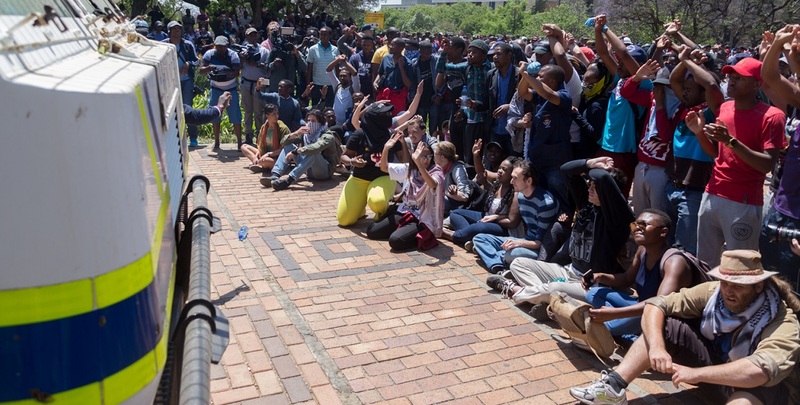 The Socio-Economic Rights Institute of South Africa (Seri) launched two documents: Student Protests: A Legal and Practical Guide and A Double Harm: Police Misuse of Force and Barriers to Necessary Health Care Services on Tuesday. The launch was held at the Holy Trinity Catholic Church, next to the University of the Witwatersrand. Speaking at the event, students from the university spoke about the challenges they faced a year after the 2016 protests. Shaeera Kalla, a leader of FMF in 2016, who was shot in the back by police with rubber bullets, said she did not return to do her masters because she was triggered by her experiences. â€œBeing at Wits is triggering, I didnâ€™t come back to complete my masters this year and many students arenâ€™t in that position where they can actually have the privilege of not coming back to this university,â€ she said. Medical student Mtwakazi Bula, who was a first aid volunteer during the protests, said the ramifications for students live on. â€œA lot of students currently suffering from post traumatic stress disorder [PTSD] where students described having flashbacks, students who are talking about how even at New Yearâ€™s [Eve] they couldnâ€™t go outside and enjoy the festivities because the sounds were triggering,â€ she said. She said some students canâ€™t come onto campus now because of the presence of private security. â€œYou canâ€™t tell your lecturer â€˜Iâ€™m sorry Iâ€™m not coming, Iâ€™m triggeredâ€™, you have to bring your doctorâ€™s letter,â€ she said. Wits anthropology lecturer Kelly Gillespie said the number of students she sees who cannot come onto campus because of PTSD â€œfeels like a pandemicâ€. â€œIt is difficult to know how to confront it because it seems so massive and itâ€™s very clear to see that the police presence on campus escalated it,â€ she said. She said the reason the vice chancellorâ€™s office gave for having police on campus was to finish the academic year because there was a very clear political argument that they should not be casual about students finishing their academic degrees. â€œWhat is important for us is to continue to show that the long-term effects has interrupted many black studentsâ€™ degrees and progress precisely because of the trauma that has occurred on campus,â€ she said. Commenting on A Double Harm, one of the authors of Seriâ€™s protest guide, Tim Fish Hodgson said there is now evidence that the university knew how students were being affected. â€œWe are not sitting next to a campus where everybody is trying to protect students; weâ€™re sitting next to a campus where people are willingly interested in violating studentsâ€™ rights and allowing that to continue to exist,â€ he said. comrades you should show where money will come from to pay for no fees higher education. Guptas have by way of pursuit to satisfy their greed exposed numerous ways rich of South Africa obtain charitable contracts to do work which could be done for 10% of cost those rich companies charge. Government workers could plus should do such work as full time government workers . This contract style of corruption have been going on for decades with hundreds of billions of rands loss annually which could pay for higher education or/plus upgrade living conditions for non rich. It is your duty as students to reveal these conditions which have been robbing you while enriching rich. As for violence authority are subjecting non violent students to I question if same approach is taken in dealing with farmers blocking highways protesting death of farmers? In both cases physical violence against person should not be employed however, I will not question using a bulldozer to remove vehicles blocking highway. Violent treatment toward students is evidence Apartheid treatment have evolved but is alive in South Africa. As for students they should not allow their protest of fees to interfere with them attending class. All may be done. A failure to due both is to practice incompetence. Incompetence in these matters is not acceptable. Very much sincere, Henry Price Jr. aka Obediah Buntu IL-Khan aka Kankan aka Gue. UCT and other universities should provide free puppy therapy to students to ease the anxiety caused by triggering. Clowns would also help some students feel better, but may trigger those who suffer from coulrophobia. A moral dilemma!